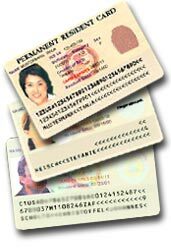 One way in which SOME people can obtain a Green Card without any form of sponsorship is to participate in the Visa Lottery which is held each year. Between October 2 and December 2, 2010 the US State Department have in effect the 2010 Diversity Visa (DV2012) Lottery program. This is a lottery where applications from all over the world are received so that the applicants can be considered for a Green Card. Not everyone in the world is eligible. Only those from traditionally low visa requesting countries may apply. Not every who applies is selected and not everyone who is selected obtains a Green Card. The Visa Lottery has strict exclusions for some countries and specific requirements that must be fulfilled by the recipients. Countries with traditionally high volumes of visa applicants are NOT eligible to apply. Thus, high volume visa applicants from the countries listed in this paragraph are NOT permitted to apply. Everyone else in the world not mentioned can apply. So, people from the near Caribbean such as Dominican Republic, Haiti and Jamaica are NOT eligible to apply. People from the following South and Central American Countries are also NOT eligible to apply: Peru, Brazil, Colombia, Ecuador, El Salvador, Guatemala and Mexico. In addition, some nationals from Asia such as those from the Philippines, South Korea, and Vietnam are not permitted to apply either. Also people from the United Kingdom are NOT permitted to apply, but people from Northern Ireland ARE permitted to apply. Also, if you are from one of the excluded countries mentioned above, but you are the lawful spouse of someone who is eligible to apply, you can claim the nationality of the eligible spouse so long as, if selected, both of you apply for the Green Card at the same time and enter the US simultaneously. So, if you happen to be from a country that is permitted to apply for the Visa Lottery, what should you do? You apply on line at www.USADiversityLottery.com . The application does require a small fee and requires that the applicant complete all the biographical information such as name, dates of birth, country of origin/birth (or nationality), address, etc. Also, the applicant must provide or upload an electronic/digital photograph to include with the application. The digital photograph requirements are very strict. The photograph must have been taken within the last six (6) months and must be similar to a passport photograph, customarily 2 inches high by 2 inches wide of the head and shoulders, no jewelry, and straight faced, for details see Diversity Visa Green Card Lottery Photo Requirements. Also, each applicant can include the names of immediate family members which are limited to a spouse and all biological or legally adopted children under the age of 21. The DV2012 lottery program only allows one submission per person, but a husband and wife can each submit a separate application and include the other as an immediate family member. Of the millions of applications submitted each year, only approximately 55,000 are selected each year. Of the 55,000, approximately 5000 are allocated to other visa programs and the remaining 50,000 are notified that they were selected or are visa lottery winners. Once selected, the applicant has a specific and limited time in which to submit a properly completed visa application or, if in the United States, an adjustment of status application. If the applicant is in the United States, s/he is only eligible to adjust status if there has been NO lapse in status. That is, when applying for the Green Card, s/he must be in a valid immigration status, usually with an unexpired I-94 arrival record. If the immigration status has expired, then even if selected for the DV2012 lottery, the application will be denied! Other requirements for the Green Card application are standard regardless if it is for the lottery or through any other means. A DV2012 Lottery recipient must not have a serious criminal background otherwise s/he will be disqualified from the application process. Simple fraud crimes such as shoplifting to big things such as drug possession can disqualify an applicant. Also, unlike the regular Green Card requirements, the DV2012 Lottery applicant must have completed high school and must produce a high school diploma or equivalent when submitting his or her visa or adjustment of status application. Improperly completing the lottery application, omitting requested information, or not uploading a photograph, will also result in the applicant�s disqualification. Once selected if the applicant has no stumbling blocks in the application process, s/he can obtain an Immigrant visa if outside the US or can adjust status if physically in the US. The applicant�s family can join and simultaneously enter the US; however, if the applicant is in the US, s/he can then file a petition to have his or her family join him in the US once he has been approved for the Green Card. This process may take a year or more if family members are overseas while the principal applicant is in the US.